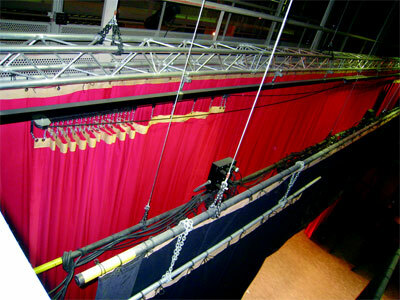 As Riggers and Technicians we move equipment and scenic elements overhead on a regular basis. This requires a higher level of diligence and care in a workplace that is often changing and fast paced. 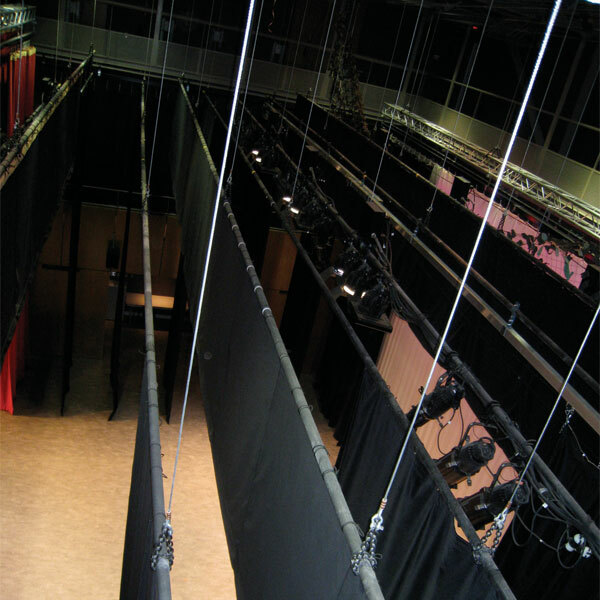 The following is a list of the five most common hazards in theatrical rigging. They are meant as guidelines for a comprehensive safety program. no part of a load passes over any worker"
It is essential that the Safe Working Load (SWL) of all components in a system are known and that the Safe Working Load for the weakest component is not exceeded. Hardware that does not have the SWL clearly forged into it is a "wild card". 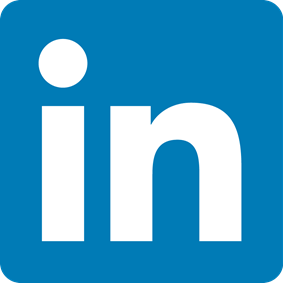 Most industrial applications work on a SWL of 5:1. A component that will fail under a load of 5000 lbs. that is given a safety factor of 5:1 has an SWL of 1000 lbs. In the entertainment industry an SWL of 8:1 is the accepted standard. 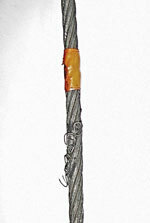 An unrated "eye bolt" has bent from overloading. Even though a component may have a sufficient SWL rating, it becomes a liability if it is not installed correctly. 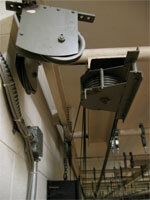 Installations should be neat and clean with hardware properly terminated. 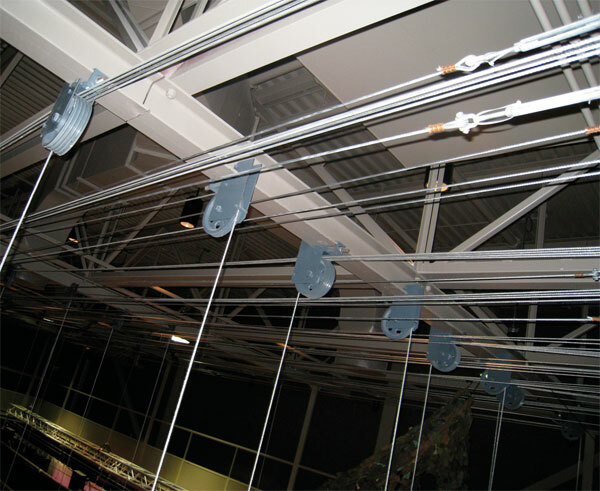 An installation that is neat and orderly allows for easier inspections and ensures that the forces on components, such as pulleys, are within the equipments design limits. 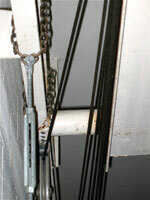 This improperly installed pulley allows the cable to rub on the side of the groove. The fleet angle should not exceed 2 degrees. 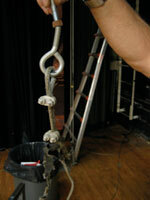 A piece of damaged equipment becomes the weak link and a liability to the system as a whole. Damaged components must be replaced immediately with ones that are of equal or greater rating. Replacing a broken part, even temporarily, with a substandard piece is putting the integrity of the system at risk. The thimble on the right has been overloaded to the point of being deformed. The thimble on the left is the correct shape. It is often helpful to compare components to confirm the degree of damage. Even the best of systems wear out. This is why it is essential for maintenance to be an ongoing process. 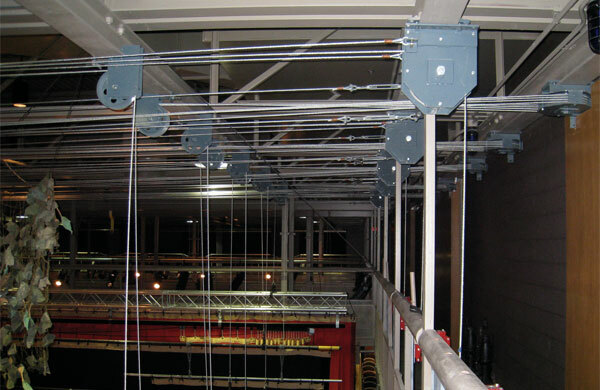 The Ontario Labour Code requires yearly inspections of all hoisting equipment. The owner must keep a maintenance and repair log. Since we are often lifting over head the operator must be aware of any changes in how the system is running and investigate the cause immediately to ensure that safe operation is not compromised. Signs of wear from everyday use can be subtle. 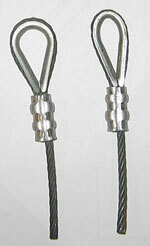 The stands of the cable shown here began to break from 25 years of use. Using equipment for purposes that it was not designed for, or modifying equipment for other purposes, can easily result in overloading and failure. Many components also have strict guidelines as to how and where they should be used by the manufacturer. For example Spectrum 3 proof coil chain is suitable for suspending stationary loads, but, if the load will be moving a Spectrum 8 chain is required. It is important to ensure that the components are appropriate for the application. 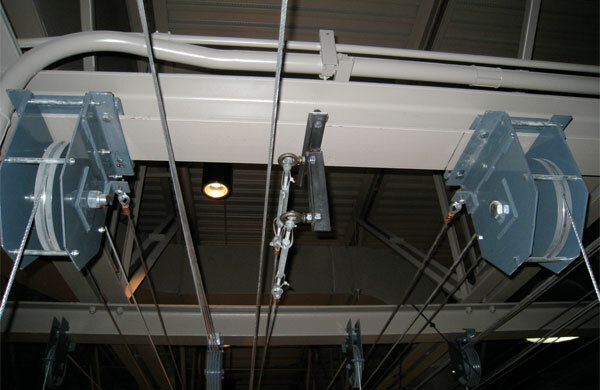 A headblock is being used to divert cables horizontally. This imposes stresses on the bearings that they were not designed for.